From home custom fabrication to handrail welding work, maintaining your metal is a part in keeping up with its aesthetics. Different metals bring a different mood and style to your home’s interior with the elegance of rose gold and the nostalgia of brass, so keeping your metal polished and protected not only extends their longevity but evokes an aesthetic that yearns for cocktails and conversation! At D & M Welding, we craft custom welding pieces that can be strewn from the walls or found in an ornate handrail that shines. Join us in today’s post, as we provide you with some practical tips to protect all of your metal. 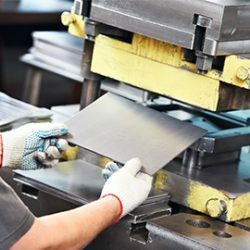 Why Care For Your Custom Metal Piece? Metal is one of the most durable materials, but it’s Achilles heel is scratches. No matter how hard it may fall or have something crash into, a scrape can be its demise. Many times too, scratch removal is almost next to impossible, so it renders your once exquisite piece of art junk metal. On the other hand, some metals are meant to look worn or tarnished with added marks or dents to tell a story and create a sense of history and personality. Whether you prefer a supremely polished metal finish or a more rustic, distressed vibe, there are specific ways to care for each one so they last and stay looking just the way you wish. Aluminum is a common metal found in custom metal pieces for its sleek look and the cool tones it can bring to your interior design. Clean any spilled liquids up immediately with a dry cloth. Maintain this metal by dusting it weekly and cleaning it regularly with warm water and mild cleaning soap. Ensure any soaps or detergents are free from sulphuric or hydrochloric acid. Avoid any cleaning utensils that will scratch the surface ( steel wool and scouring pads). Aluminum naturally oxidizes and creates a protective barrier — when you wipe it with a cloth, don’t be alarmed by a black residue that comes off, this is perfectly normal and not defective. Look into stain removal products such as Brasso which is a specific metal polish. Brass is diverse and can come with a myriad of aesthetic from oxidized and shiny to brushed. Oxidized brass looks slightly tarnished and extra dents and scuffs are added to give it a more vintage look. Because brass is a hardy, non-corrosive metal it does not exclusively require a regular polishing. Many people enjoy shiny brass because of its similar color to gold. With its high-gloss shine, it makes for popular kitchen and bathroom hardware choices. Brushed brass is a bit more subtle and muted and people prefer it for its more modern appearance. Like oxidized brass, shiny and brushed brass are strong and corrosion-resistant so regular polishings are not required. The blushing rose gold has exploded in the home decor realm and is used for its warm tones and boho chic vibes. Its hue invites glamour and a Hollywood charm to spaces. Wipe up any spills promptly with a dry, clean cloth. Spruce up regularly with mild soap/detergent and warm water. Protect any tabletop surfaces with coasters or placemats. Iron is a metal that just about predates our history and it’s an extremely rugged choice for metalwork. 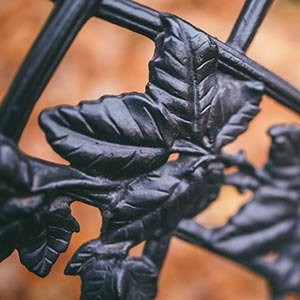 Iron is heavy and robust and is the perfect choice for a handrail embellishment or medieval welded art piece. Bronze has a rich intensity to it that draws you in, making it an excellent metal for home decor. Don’t let liquid or moisture sit — wipe it up quickly with a clean, dry cloth. Do not clean with scouring pads or steel wool. Do clean with warm water and a mild detergent. Pro tip for all metals: Wipe in the direction that follows the grain. Typically, most metals are tough and can withstand a variety of environments, especially as most are protected and housed indoors. Below are some general guidelines and things to keep in mind for improved metal care. The comprehensive list above gives you an idea as what can begin to tarnish and corrode your metal but fingerprints are some things that are easily overlooked, yet extremely damaging. Your fingerprints contain a culmination of acids, sugars, and proteins and residues of anything else that you may have touched. When you touch metal and don’t wipe your fingerprints soon after, over time, they can begin to cause site-specific corrosion and cause your print to be etched in the metal permanently. While you can buff out prints, these are very difficult to remove. On items that you handle and clean regularly, this is not so much an issue as something that gets fingerprints smeared once and then is forgotten and left uncleaned. This is why people with antiques can be so protective and handle their metal goods with white gloves or clean these items meticulously. Physical damage can happen as metal parts and pieces may fall or break off as a result of poor storage or not being hung with proper care. Metal is wonderful because it’s malleable and can oftentimes be mended through welding work to correct any physical damage. Metalwork is an investment whether you’re wanting ornamental welding or a stylish handrail, so caring for it is just as vital. 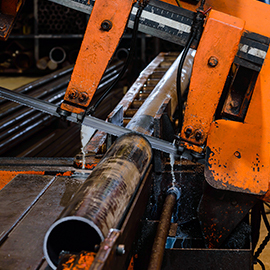 At D & M Welding, we do a variety of custom fabrication in the commercial and residential domains. In addition, we offer repair services to construction equipment, trucks, and blasting and finishing — if it’s metal, we can likely fix it! For more information on our decorative welding or commercial fabrication, connect with us today! ©2018 D & M Welding Co - Do not copy. All rights reserved.